Looking for a custom mod! First time posting in the forums here, so not 100% sure if this is the right section. 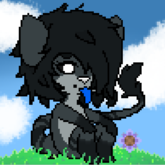 But as the title suggests, I'm looking for someone to work with to make a custom mod to look like my sona. Send me a message if interested for details! Thank you!